MEMS2017 is held under the theme "MEMS and IoT for Smart City". This presentation shows the outline of the lectures and characteristics of the MEMS society. Dr. Naoto Kobayashi received the B.S. degree in Physics in 1973, the M. Eng. degree in Nuclear Engineering in 1975, and Ph.D. degree in 1978 from Kyoto University. In 1978, he joined the Electrotechnical Laboratory (ETL). He was engaged in the research of quantum beam material interaction. From 1998 through 2001 he worked as the Director of Quantum Radiation Division of ETL for quantum beam frontier technologies. In 2001, he became the Director of Photonics Research Institute of the National Institute of Advanced Industrial Science and Technology (AIST). He worked as the supervisor of the national project of 'Femtosecond Technology (1995-2005). From 2003 to 2009 he has been Vice President of AIST. He worked especially for the research evaluation system in AIST. Since April 2009, he is professor at Center for Research Strategy, Waseda University, Tokyo and also emeritus advisor of AIST. He currently performs research in the field of research strategy and evaluation in addition to the photonics research. 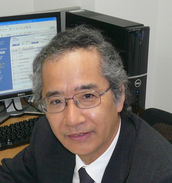 He works as chairman of the research evaluation committee for METI and NEDO.